Norland Ossingburn Lo-Ridge Log Cabin: The Norland Ossingburn Lo-Ridge Log Cabin offers a spacious interior room and a large covered porch area, providing lots of functionality within its 5.2m by 5.4m footprint. The interior is accessed via generous windowed double-doors, which stand between two double windows that provide lots of natural light and with their tilt and turn operation the option for ventilation on warm days. With an interior space of 19.2m/sq, the cabin can accommodate a range of uses and can be decorated with a variety of furniture items. The modest roof angle of 10 degrees makes the cabin a very appealing and attractive shape, the ideal wooden cabin for any outdoor area. 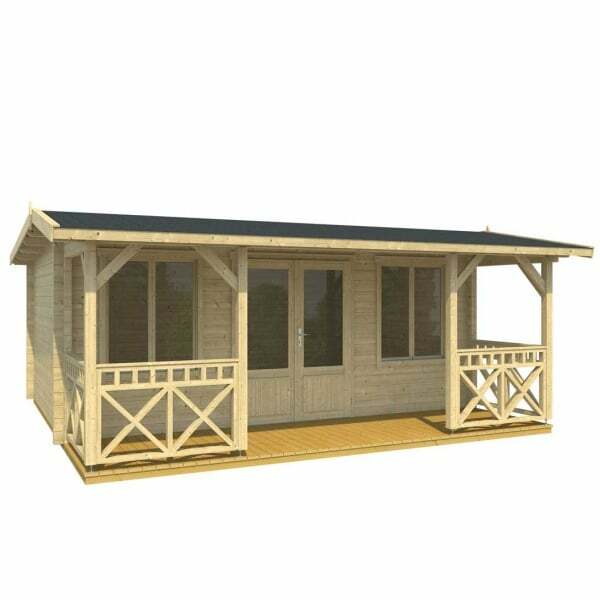 The Norland Ossingburn Lo-Ridge Log Cabin is easy to assemble and are an extremely sturdy structure as they are built in the traditional Log Cabin style and therefore uses no screws or nails in the wall construction. The Norland range also feature chalet corner jointing to give that extra timber jointing for extremely good weather resistance.